More than 8 million people live in New York City. Tomorrow, they head to the polls to cast votes in the citywide party primaries. To help New York City voters find where to vote in the primary elections, how to get there, and who is on the ballot, we’ve launched the latest edition of our Voter Information Tool. 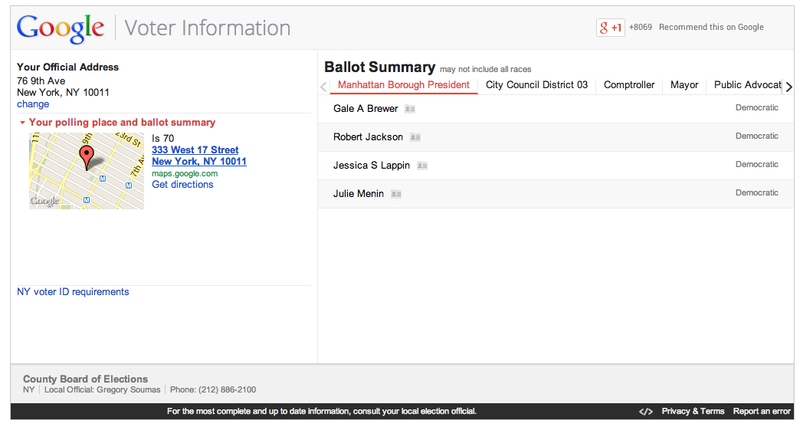 Voters can enter their address to find their polling place and locate it on a Google Map. They can also find ballot information and candidate details for races all the way from Mayor and Borough President to Public Advocate, as well as easily check voting rules and requirements. We hope this tool will help New Yorkers from Staten Island to the Bronx find all the information they need as simply as possible.